Collage: As Fun As It Looks! This piece isn't too much different from my mixed media works, except for the text. It was adding the text, however, that made this piece an official collage for me. It was originally just a little mixed media cat, but I wasn't too excited about the finished look. Layering tissue paper, acrylic (including some metallic gold paint), and chalk pastel, I thought the piece would have more punch when it was finished. 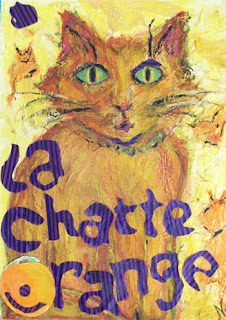 I gave it the title "Chat Orange," which got me thinking about what influenced the piece in the first place. Toulouse Lautrec has always been one of my favorite painters, and the "Chat Noir" prints have been regulars in home decor and greeting cards in my family. I was disappointed to learn as an adult that the Chat Noir was actually a bar, not a character that would appear in more of his pictures. 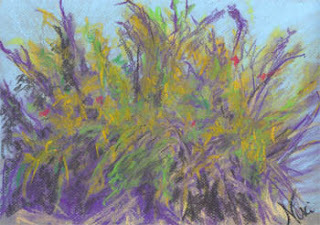 Another afternoon at home, another quick plein aire session with the pastels. The above painting was done in about 20 minutes. There are two things that help me complete a quick daily painting like this: working small and keeping the painting simple. We have many scrub oak trees on the property, and there is one that sits somewhat by itself in the driveway. I've always liked this tree, because it differs from the others in that it is taller and always has a dramatic shadow. I sat on the ground to paint this, and chose to keep the composition simple, focusing on the tree and its shadow. The view behind the tree actually has hills and flowers in it, but I knew that those would complicate the process and take away from the bold position of the tree. So, I filled the background in with sky instead. I have neighbors with beautiful houses; we jokingly say we're the poor folks on the block. 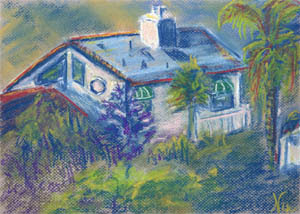 Buildings have always presented a challenge for me, though, so I've been a little shy about painting houses in general. Still, I'm getting pretty comfortable with plein aire, which makes it easier to take risks. While out with my sister, I spotted a peculiar looking bunch of plants. My sister had to identify them for me: bromeliads! I thought it was a funny name to go with a funny-looking flower, and took several photos for a future painting. 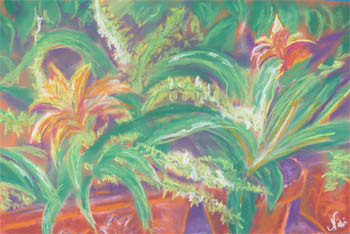 These particular bromeliads were orange, and stood out among all the green surroundings. When deciding on colors for the painting, I was in the middle of a green, purple, and orange streak (also known as "secondary colors"), and began blocking in the shapes on orange-toned Canson Mi-Teintes paper. I always run into the struggle between color and value, and emphasizing one or the other. For this piece, I stuck to the original color inspiration, which slightly flattens the image. I particularly enjoyed highlighting the pottery, and felt that the color scheme gave it a twist on a typical floral painting. translate photographs posted by fellow group members. I've never worked on a collaboration like this before, and wanted to select a piece I had a genuine interest in so I could give it my best. Plen Aire at the Fair: No Sissies Allowed! Sunday, June 26th: one of the most anxiety-inducing, exhilarating days of my life. 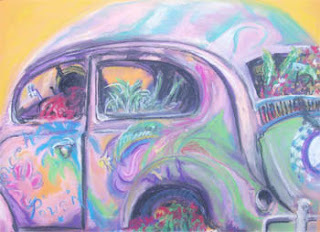 It was plein aire day at the San Diego County Fair in Del Mar. After a peaceful drive, a slight snag with the parking permit, and about a half hour of perusing the fairgrounds for a spot to paint, I trotted my "cart" with my supplies to the farm area in the children's section of the fair. One of the challenges I worried about with painting plein air was light. The first couple of days, I waited in the morning until the fog burned off, so there would be enough light. Of course, once the light made an appearance, so did the bugs. 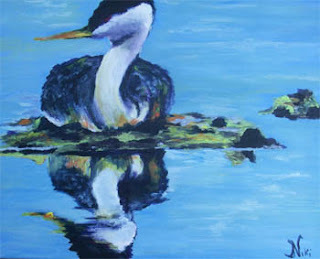 The next few days (leading up to June 26th), the timing was better for me to paint in the afternoon (or dusk). 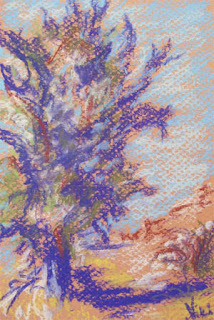 The piece above, "Pomegranate Bushes," was painted in the late afternoon, as the sun was setting to the west.